Some cloud formations are fascinating while others are quite frightening to watch, such as funnel clouds. Learning more about this cloud form is very important especially if you live in an area where tornado often strikes. Read on. Funnel clouds appear like funnel shaped clouds rotating underneath a thunderstorm cloud but not making any contact with the ground. These clouds are not yet considered tornadoes, but all tornadoes go through this cloud formation prior to reaching the ground. Funnel cloud develops whenever there is a supercell thunderstorm. How do Funnel Clouds Form? Funnel clouds develop when the inflow of air into the supercell thunderstorm swirls, hence, forming a funnel. This occurs due to wind shear wherein the direction or speed of wind flow changes with height. Horizontal vorticity occurs due to very strong wind shear and with strong thunderstorm updraft, it can easily turn vertical. As the velocity of the wind intensifies, a warm downdraft wraps the base of mesocyclone (strong column of wind that spins more fiercely in the thunderstorm’s updraft) which can further intensify and tighten its rotation, thus, producing a funnel cloud. Funnel clouds are classified into waterspout and landspout. Both types of funnel clouds touch the ground but are quite weak in comparison to tornadoes. This is the type of funnel cloud that occurs over a body of water. It develops on the underside of a congestus cloud and the low air pressure triggers the wind to twirl forming a waterspout. Waterspouts can be found at elevations from a few hundred feet to more than a few thousand feet. They also normally last not more than 15 minutes. This type of funnel cloud is the equivalent of waterspout but happens on land. Land spouts develop just like gustnadoes but are stronger and last longer. At What Height are Funnel Clouds Found? Funnel clouds develop at mid-level altitude where the atmospheric instability is pretty strong. Mid-atmospheric elevations may be anywhere between 6,500 feet and 10,000 feet from the ground. What do Funnel Clouds Look Like? These cloud formations exhibit a cone-shaped appearance extending beneath the thunderstorm cloud. In some instances, funnel clouds are confused with virga clouds. To confirm that it is a funnel cloud, look for a smooth cloud rotation that extends downward. How common are Funnel Clouds? 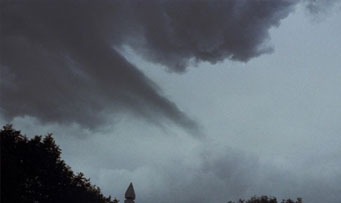 Funnel clouds are very common in areas where tornadoes recurrently strike, such as the United States. This cloud formation is often seen during summer and spring months especially on the eastern stretch of Rocky Mountains, along the Gulf Coast as well as the southeastern states. Watching funnel clouds can be a unique and exhilarating experience but always think of your safety as it may quickly become a very destructive tornado.